A lot of weird stuff crosses the communal desk known as the WFMU new bin, but when records by Mors Ontologica started drifting through said territory back in 2007, I knew right away they'd be going big places. Provided, of course, that we have a shared understanding of "big places" meaning "somehow slipping entirely under the radar of music tastemakers and the approval index to which they contribute." Yeah. Too bad for Mors Ontologica—a band that deserves the accolades of present history's rock royalty, but whom today will have to settle for the enthusiastic ramblings of a benched WFMU DJ who usually blogs about cooking. With luck, 2011 will be their year to finally conquer. Cultural injustice rhapsodies aside, it is an incredibly classy move on the band's part for posting their entire recorded output in the Free Music Archive for download. That's a pair of stellar albums, two EPs, and two excellent live sessions recorded on WFMU by the mighty Liz Berg. Mors Ontologica deliver lo-fi crud rock in the finest Ohio tradition (think Thomas Jefferson Slave Apartments, Mike Rep & the Quotas, Gaunt), with gravelly vocals pushed waaaaay the hell up front, and an approach to the three chord theory that somehow manages to sound fresh and innovative. On a few songs, they even wheel out the sax and keyboards with sonically expansive effects that in no way dial up comparisons to skinny-tied new wave bands. Yeah! From the intimidating 55 tracks available for grabbing in the FMA, I created this album-length mix as a more compact and approachable gateway for those who've not yet sampled this fine band's wares. In other words, these are my immediate favorites which have been culled from the Don't Cry and Dead and/or Famous LPs, as well as the equally awesome Telemetric Action EP. Give this mix a listen, and then go digging through the tracks I've omitted for more excellence. Better still, pick up all the original vinyl from VSS Records who've just released the band's brand new double LP. All hail Columbus! Like a lot of my peers who got hooked on weirdo music during the mid 80s, the arrival of the New Bomb Turks circa 1991 was something of a religious epiphany. At that time, I was a lowly fanzine editor who'd recently wormed his way into a DJ slot on Princeton's massive commercial college station, WPRB. In spite of my townie status, I thought of myself as already being pretty knowledgeable of the contemporary underground acts that PRB championed. As a result of that (misguided) assertion, I wound up spending countless overnights in the station's record library, often firing up the transmitter two or three hours after official broadcasting had ended in order to air a bunch of weird vinyl I'd plied from PRB's enviable stacks. Among the coolest and wildest records I got acquainted with on those 3-6 AM musical odysseys were the Back From the Grave series of 60s punk compilations, released by the brazen Crypt label. Those comps, as has been noted by all sorts of rock royalty from Byron Coley to Johan Kugelberg, effectively retrofitted a miniscule slice of the past with a bold, new identity. More importantly, they became a springboard from which a new musical aesthetic (90s garage rock) was forged. As such, when Crypt Records released the Turks' debut LP in 1993, I'd unknowingly primed myself to be instantly hooked. The Turks quit being a full time band a few years ago, though they do still play out from time to time. 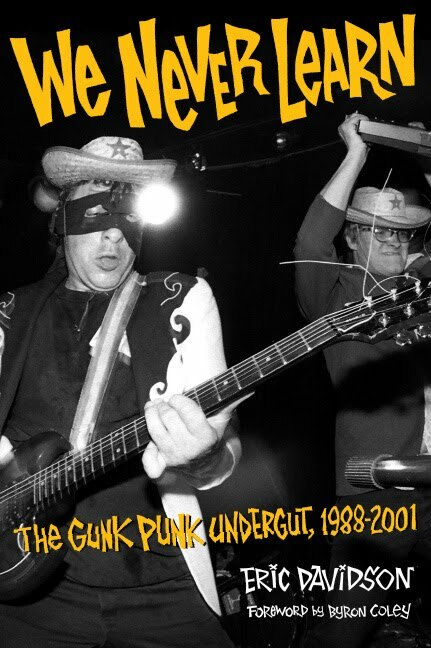 Eric Davidson's got a new book out called We Never Learn: The Gunk Punk Undergut that details the rise and fall of the 90s garage scene that he and his bandmates helped ignite. Welcoming them to WFMU's Jersey City studios remains one of my proudest broadcasting moments, and I'm beyond thrilled to finally share the aural rewards of that evening. You can stream the whole set with the link below, or head over to their artist page on the FMA to download the tracks individually. Had the severe pleasure of hosting the Columbus, Ohio trio Mount Carmel in the WFMU studios live this week, and it was a burner. Despite ties to Siltbreeze and a zipcode that also harbors the likes of Times New Viking and Psychedelic Horseshit, the sound of this band is not going through any kind of gauze, in fact they are bare-boned straight-up blooze rawk with no post-modern filter, ironic pretentions, or loaded message. Cream, Hendrix, the Groundhogs, Peter Green, Free all loom large over the brothers Matthew and Pat Reed, joined by young drummer wunderkind Kevin Shubak, and the results are nothing short of fantastic. Solid, n' simple, sit down at the table at eat, y'all! Thanks to Jason Sigal for engineering and help upping the blister factor in the Live Room!